Internationally recognized artist John McCracken commenced developing his earliest sculptural work while in grad school at California College of Arts and Crafts along with Minimalists John Slorp and Peter Schnore, and painters Tom Nuzum, Vincent Perez, and Terry StJohn, 1964, 1965. Equally well known Dennis Oppenheim, enrolled in the M.F.A. program at nearby Stanford, was a frequent visitor to this more vibrant graduate program. 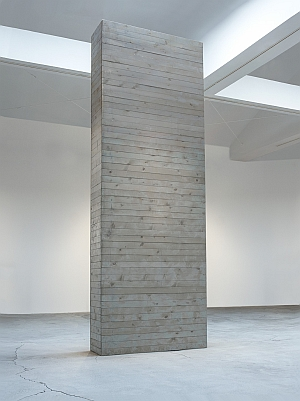 While experimenting with increasingly three-dimensional canvases, McCracken began to produce art objects made with industrial techniques and materials, plywood, sprayed lacquer, pigmented resin, creating the ever more minimalistic works featuring highly-reflective, smooth surfaces. He applied techniques akin to those used in surfboard construction—popular in Southern California. Later McCracken was part of the Light and Space movement that includes James Turrell, Peter Alexander, Larry Bell, Robert Irwin and others. In interviews, however, he usually cited his greatest influences as the hard edge works of the Abstract Expressionist Barnett Newman and Minimalists like Donald Judd, Dan Flavin and Carl Andre.